What is your favorite food—EVER? Pizza, ice cream, fried chicken, broccoli? Mine? None of the above. It is the very humble, very nutritious, and very versatile potato. *I didn't know this, but a resistant starch is one that doesn't fully break down and get absorbed, and is instead turned into a short-chain fatty acid by intestinal bacteria. The bottom line is that it becomes food for the good bacteria (probiotics), which make resistant starches prebiotics. Read more about resistant starches here. Red, white and blue, potatoes are patriotic, too. Potatoes come in a variety of colors. Most are white or pale yellow on the inside. These come in red, white and yellow skin, are generally similar in texture and are good for frying or potato salad. Russets (bakers) are also white inside, but have brown skins and have a drier texture making them better for baking and mashing. 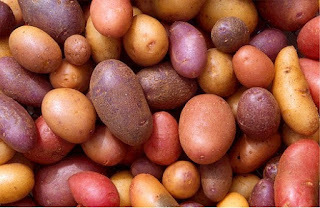 "Purple potatoes boast more health benefits than their white counterparts. The golden rule with any fruit or vegetable is the darker and deeper the color, the more nutritional benefits it packs. They contain carotenoids and the color comes from their flavonoid content. These potatoes are high in carbohydrates, low in fat, high in potassium, and contain a small amount of iron and a moderate amount of dietary fiber, which can help regulate blood sugar and prevent high cholesterol. They’ve also shown anti-inflammatory properties. Blue potatoes also contain anthocyanins—an immunity-building anti-oxidant that fights free radicals, reducing the risk of cardiovascular disease, stroke and cancer. The skin is rich in vitamin C and contains polyphenols. The skin also helps seal in the nutrients while cooking, so try to leave it intact." Besides the ever-popular french fry, what else can you do with this versatile veggie? Just about anything you can think of. You can roast, bake or boil, mash, saute or grill it. You can slice it, dice it or spiral it. Morning, noon or night, potatoes fill the bill and satisfy the stomach. Start your day off right with potatoes for breakfast as hash browns or home fries or grab baked potato or soup as a lunch option, but beware the loaded potatoes will get you with the added calories. Nothing dresses up dinner like creamy mashed potatoes with butter or gravy, and it goes with practically everything. I can eat potatoes (a.k.a. taters) anyway you fix 'em. Fries, bring 'em on. Baked, with butter and sour cream, oh and maybe some cheese, please. But I've got to tell you about something called tater hash. 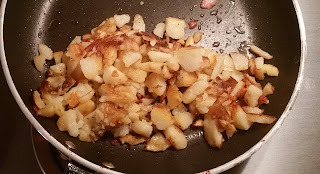 Nope, not hash browns or home fries and there is no meat involved. These are some of the best taters on the planet, in my humble opinion. First you bake the potatoes. Exact time and temperature is not critical, the lower the temperature the longer the bake time and so on. I usually bake large potatoes at 400° for about 75 minutes. Just cook them until a sharp knife goes in easily. Remove them from the oven and cool on the counter. When cool enough to put in the refrigerator, go ahead and do so. Leave them in the refrigerator several hours or overnight. 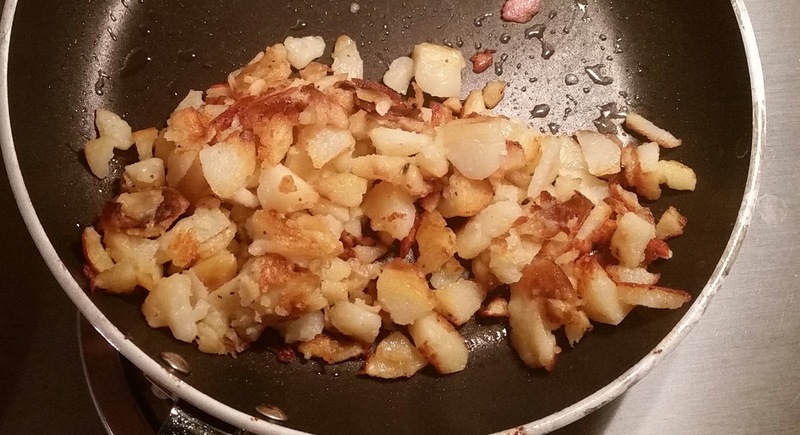 Cold potatoes make the best hash! Then you make the hash. Peel and chop the potatoes into bite size pieces. Heat your fat of choice in a skillet over medium high heat. The oil is hot when a piece of potato sizzles when it hits the pan. Cook, turning them occasionally, allowing them to develop a crusty brown surface. I usually use my spatula to further chop them up in the pan. These are excellent just as they are, but you can kick them up a notch (to quote Emeril) and add onions, green peppers or other seasoning. I like mine plain with just salt and pepper. I have been eating these my entire life, and some of the best I ever had were cooked on an old wood stove at my grandmother's house. Talk about good eats! Have you eaten blue or purple potatoes? What is your favorite way to eat potatoes? Another kindred, potato-loving spirit, yay! Some people avoid potatoes because they're carbs, but they are good carbs and not fattening unless you drown them in fat. Potatoes on their own are very nutritious! Wow! Learned a lot more about potatoes! And I live in Idaho, which is famous for its potatoes. We even have them on our car license plates. Hey Christine, thanks for visiting. I occasionally have trouble leaving comments at your blog. My mom grew up in Maine, which is another potato state, so that may be where I came by my love of taters.